First up: Best post title ever. Aaanyway. Few more races done. Weaver Valley went with a bang. Well, a snap, as my mech hanger did what it’s sort of supposed to and snapped as everything packed up with leafy, grassy mud. Annoyingly it happened about 20ft after the pits, so I had a nice half lap jog (Finally! All that horrid lunchtime jogging pays off!) before I could swap to the 2nd bike. Also annoyingly the mech got knackered in the explosion, as did the chain. Spend spend spend! You don’t need a mech for the running sections anyway. Pic by Dave Haygarth. The rest of the race went OK – the “intermediate” tyres were a bit frisky in the corners but I ended up still in the top ten, so I’m not moaning too much. Next race as back at (the cursed) Otterspool. So I marshalled instead. Ha. Average league points without having to ride into any trees. I’ll take that. 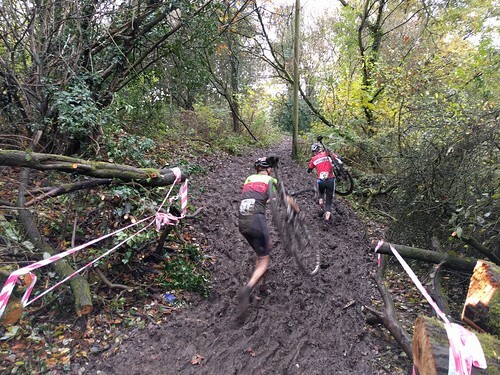 Especially as all I had to do was keep people off the course while racing was on, move some course tape, heckle everyone, stifle evil cackles when people wiped out (without getting hurt, obvs) and drink free coffee. Everyone should have a go at marshalling. A return to Stadt Moers next (though that doesn’t appear in the post title). Another good race course with lots of good close racing as a result (though a few of my “slide right across the course” moves were a bit crap. Sorry everyone!). Only issue I had was with a front mech that wouldn’t shift into the big ring. don’t think it really made any difference though. 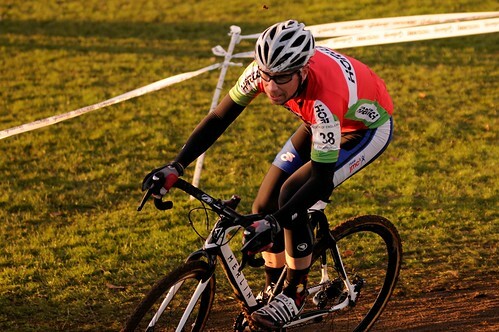 Oh, and the “fast but not mud” tyres not liking the slidey mud – hence the “across the course in front of people”action. Sorry again! 4th and time to swap to slower, gripper tyres. First, last or just propping up the mid table, race your arse off wherever you are! Still to come: Christmas and…more importantly…the final round of the NW league, the National Champs and possible another Yorkshire league round to make sure I get my money/efforts worth out of all that tub gluing!